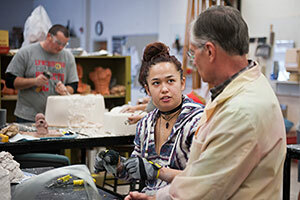 At the University of Lynchburg, we believe that creating art is an expansive process. Art and design are powerful tools that can be used to reflect and make an impact on our society. As an art major, you’ll experience one-on-one learning with faculty in a top-notch studio or lab setting to develop a rich understanding of traditional art applications, art history, design practice, and visual communication. 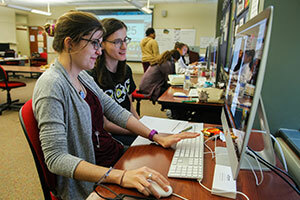 Student artist-designers at the University of Lynchburg learn to be creative practitioners and image makers who bring form to emotions and ideas through the exploration of medium, storytelling, and composition. We offer a major (BA) in art (graphic design or studio), and minors in art history, graphic design, digital media arts, and studio art. Double major in Education and Art for Teacher Licensure K-12 certification. Lynchburg offers two major (BA) art emphases: Studio art, which includes painting, drawing, sculpture, and photography; and graphic design. Learn the art of visual communication, including composition, typography, illustration, photography, and how to combine elements to create a cohesive body of work. Become well versed in art history, and learn concepts of composition. Express yourself through a variety of media, including painting, drawing, sculture, and photography. Lynchburg students paint piano for Hill City Keys. Read more. Students win ADDY awards. Read more.